Daily Illuminator: Munchkin Warhammer 40,000 First Expansion Is At Print! December 11, 2018: Munchkin Warhammer 40,000 First Expansion Is At Print! 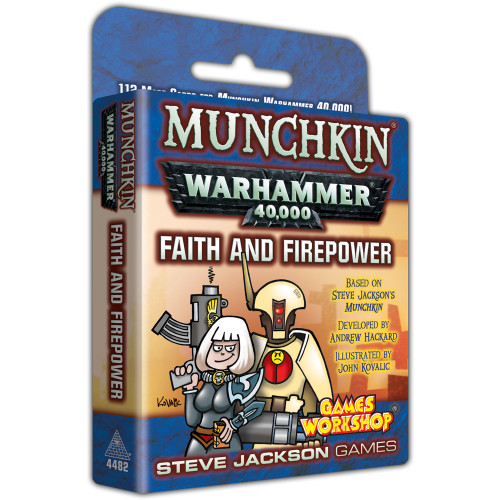 We're pleased to announce that the first expansion for Munchkin Warhammer 40,000, Faith and Firepower, has gone to print! It features the Adepta Sororitas (the fierce "Sisters of Battle") and the truly alien T'au, who are sometimes mortal enemies, sometimes loyal allies. We're anticipating a release late next spring. Kudos to our production team of Sabrina Gonzalez, Alex Fernandez, Gabby Ruenes, and Ben Williams for getting this done and out the door. Special thanks to John Kovalic for his art and consultation (yes consultation – he's a Warhammer 40,000 fan). Also to Shelli Galey for wrangling the art on our side, and Alex Aulisi for dealing with John's business so John could focus on drawing. Further special thanks are due to Alain Dawson, who has been our liaison with Games Workshop during this whole process. And a fond farewell to Miranda Horner, who completed the prepress on Faith and Firepower as one of her last tasks before moving on to new challenges. We'll miss you!